Among urinary disorders the formation of stones is the most prominent type of disease in our country. A large population of the country suffers from kidney stones which are formed due to the deposition of calcium, phosphates and oxalates. Presently, the incidences of kidney stones are rising in urban societies due to changes in lifestyle and dietary patterns. When calcium oxalate concentration is four times higher than the normal solubility, a crystal starts to form. In low urine volume, the presence of high calcium and high oxalate, increase the super saturation of calcium oxalate. Citrate in the urine forms soluble complex with urinary calcium. If urine has low citrate concentration super saturated calcium oxalate is promoted to form calcium oxalate stones. If urine pH is > 6.5, proportion of divalent and trivalent ions are increased then super saturated calcium phosphate is favourable. The levels of urinary super saturation of the different solutes determine the specific types of stones. 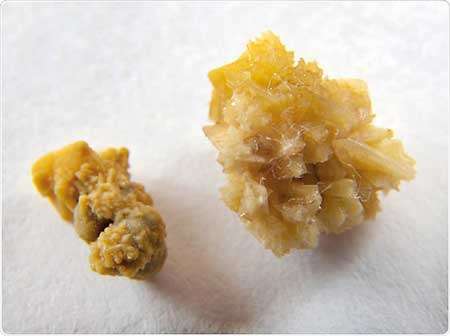 Approximately 70-80% of kidney stones are calcium oxalate and calcium phosphate; 10% struvite; 10% of uric acid; and less than 1% are cysteine. However, according to the research studies, approximately 86% of renal stones in Sri Lanka are occupied by Calcium Oxalate stone. 1Calcium oxalate stones- This is the most common type of kidney stone experienced by males. They tend to form when the urine is acidic. Some of the oxalate in urine is produced by the body. Calcium and oxalate in the diet make a significant contribution toward the formation of this kind of stone, but these are not the only factors that aid the formation of calcium oxalate stones. Dietary oxalate is an organic molecule found in many vegetables, fruits, and nuts. Calcium from bone may also play a role in the formation of kidney stones. 2Calcium phosphate stones- These stones are common in females than in males. Calcium phosphate stones tend to form when the urine is alkaline. 3 Uric acid stones – This is a common type of kidney stone that forms in both males and females. It is more likely to form when the urine is persistently acidic. At a urinary pH of less than 5.5, uric acid is poorly soluble. A diet rich in animal protein, due to its high purine content, produces uric acid in its catabolism which may increase the risk of forming uric acid stones. 4 Struvite stones – They are referred to as triple phosphate stones or infection stones. These stones result from the presence of upper urinary tract infections with urease-producing bacteria. The bacterial urease is essential for the development of struvite stones since it leads to an elevation in ammonium, carbonate and urinary pH all at the same time. And given this situation, phosphate combines with ammonium, magnesium and carbonate to form a stone composed of magnesium ammonium phosphate and calcium carbonate-apatite. 5 Cystine stones- These stones form equally in males and females, although males are more severely affected. Cystine stones are a result of a rare genetic disorder that causes cysteine an amino acid; one of the building blocks of protein to leak through the kidneys and into the urine to form crystals. How does diet influence the formation of kidney stones? Diet is one of the most prominent factors which plays a significant role in the formation of kidney stones. Our body uses food for energy and tissue repair and afterwards the waste products in the bloodstream are carried to the kidneys and excreted as urine. Certain food creates waste that may form crystals in the urinary tract. In some people, the crystals grow into stones. Soft drinks have increased the risk of stone formation due to effects of glucose and fructose on increasing urinary oxalate. Some researchers have reported that drinking 2 Litres of regular cola increased urinary oxalate. Regular tea, both black and green tea, also contains substantial amounts of oxalate while herbal tea has much lower oxalate contents. In addition to that, high consumption of grapefruit juice is associated with increased risk of kidney stones in both men and women because certain research studies have proved that drinking of 240 ml of grapefruit juice three times per day increased urinary oxalate from 41 to 52 mg/dl. When excreted the sodium in salt by the kidneys, causes more calcium to be excreted into the urine. High concentrations of calcium in the urine combine with oxalate and phosphorus to form stones. Some food (Ex: hot dogs, processed frozen food, fast food etc.) have such large amounts of sodium that a single serving provides a high amount of the daily intake. Animal proteins such as meat, eggs and fish contain purines, which break down into uric acid in the urine. Food that are especially rich in purines like animal liver fall in this protein category. People who are suffering from uric acid stones should limit their meat consumption to recommended daily intake. Nondairy animal proteins may also increase the risk of calcium stones by increasing calcium excretion and reducing the citrate excretion into the urine. Citrate prevents kidney stones while the acid in animal protein reduces the citrate in urine. Calcium in the digestive tract binds to oxalate from food and keeps it from entering the blood, and then the urinary tract, where it can form stones. People who are suffering from calcium oxalate stones should limit their daily calcium intake. A cup of low-fat milk contains 300mg of calcium. Other dairy products such as yogurt are also high in calcium. Some research studies indicate that calcium supplements increase the risk of forming calcium oxalate stones. Some of the oxalate in urine is made by our body. But the consumption of certain foods (spinach, wheat bran, nuts etc. ), which are high in oxalate, can increase the amount of oxalate in the urine, where it combines with calcium to form calcium oxalate stones. Consuming food which contains calcium also reduces oxalate in the urine. Calcium binds oxalate in the digestive tract so it is not excreted into the urine. Food supplements containing vitamin C or D may contribute to the formation of stones. Vitamin C can be converted into oxalate by our body. Calcium supplements should be taken with meals, so the calcium can bind with the oxalate in food. In conclusion, kidney stones are a major threat to our society due to unhealthy feeding habits and questionable lifestyles. There are 05 major types of kidney stones when getting to know about kidney stone types. This information is helpful to determine what kind of dietary changes may be needed for the individual. The diet is a prominent factor which can effect the formation of kidney stones. 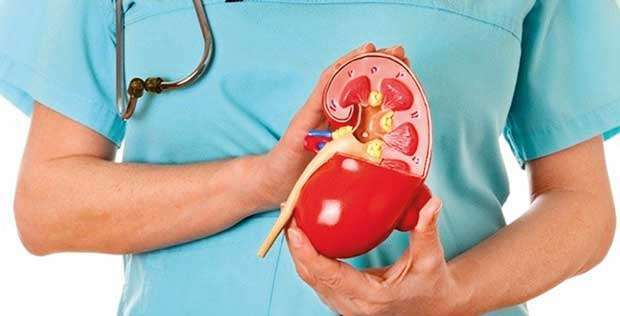 Other than diet, body weight, alcohol consumption and certain medicines also make significant contribution toward the formation of kidney stones. The most important factor is the daily consumption of water. The consumption of enough water has a higher affinity to minimize the formation of kidney stones.